Catba Central Hostel i Cat Ba Island, Vietnam: Reservér nu! CatBa Central Hostel, situated on the ocean/harbour promenade, offering 54 beds in two shared dorms and two female dorm. 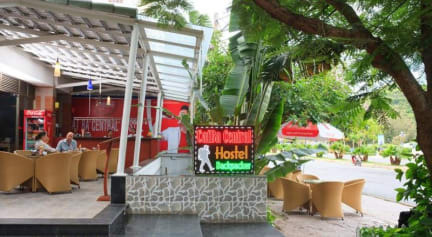 Private rooms are available in our owned hotel adjacent to the Hostel.Meals are served in our lobby or in the garden bar courtyard. Free high-speed wifi is available throughout the Hostel, and garden bar areas. Our staff is mixed of local CatBa residents and foreigner, with excellent English skills. Our staff will advise and arrange activities, including day boat Eco-Tours, Lagoon inlet / Cave Kayaking, Swimming, Coral Snorkelling, Rock Climbing, Island Hiking, Mountain Biking, and Fine Dining. Motorbike Rental and Laundry. Pickup can be arranged from CatBa ferry/bus terminal, or HaiPhong ferry/bus terminal, on prior arrangement. Filthy hostel. No Security, you could just walk right in in the middle of the night.